Time is running out to finish your March Madness brackets. As with every year, games will lock and you will be as confident as ever. This is the year a perfect bracket is submitted. And guess what? It’s yours. Virginia is looking as strong as ever. Will their first test come in the Sweet Sixteen, or will they coast to the Elite 8? Then, boom. The Retrievers from UMBC pull off the biggest upset in college basketball history, shocking the entire world. Upsets are a part of the NCAA Tournament. 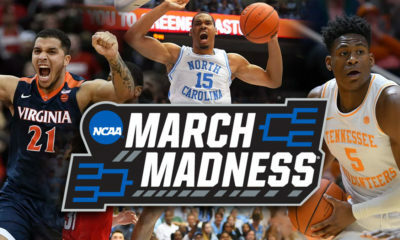 They put the madness in March. It is nearly impossible to predict where all of these upsets will come from, but we can use history as a tool to give us that extra “oomph” to at least win our money pools. It can also be used to make you money at BetNow Sportsbook, or wherever you place your bets. Before we get into where these upsets will come from, we need to establish what exactly qualifies as an upset. 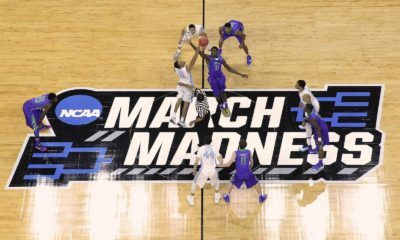 I will use the definition taken from NCAA.com, which is a team winning a NCAA Tournament game against opponent ranked at least two seeds above them. So, using this definition of an upset, let’s take a look at the past 34 seasons (tournament expanded to 64 teams in 1985). In 27-of-34 seasons, there have been between 10 and 16 upsets, with an average of 12.2. Now, there are a couple outliers. 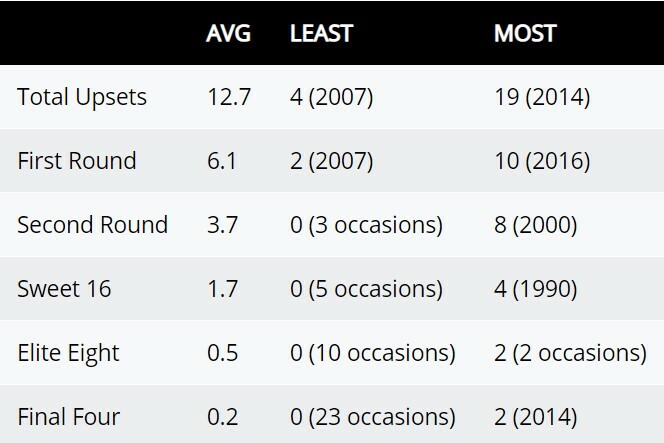 The least amount of upsets was four, back in 2007. The most has been 19, which was the crazy 2014 tournament. Knowing this, you should probably include around nine or ten upsets in your bracket if you want to take home the money. If you’re feeling extra risky, go between 12 and 16, but you’re risking sinking the entire bracket if you predict the wrong upsets. We now have an idea of the number of upsets that will occur, but knowing where they come from is another animal entirely. But again, we will use history of as a predictor. 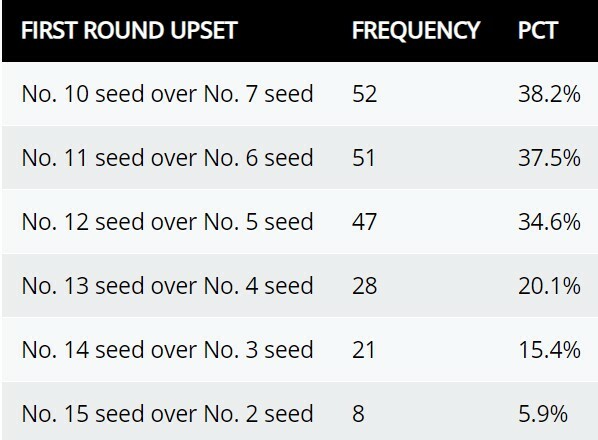 Obviously, most of the upsets occur in the first round. Here is the breakdown. When looking at the most common upset matchups, the 7-10 games, the most likely upset I see is Minnesota (10) over Louisville (7) in the East region. Led by Senior Jordan Murphy and Junior Amir Coffey, the Gophers played well in close wins over Penn State and Purdue in the B1G Tournament, before losing to Michigan in the semi finals. The Cardinals, on the other hand, have lost eight of their last 12 games. The other 7-10 matchups include Cincinnati-Iowa, Wofford-Seton Hall, and Nevada-Florida. 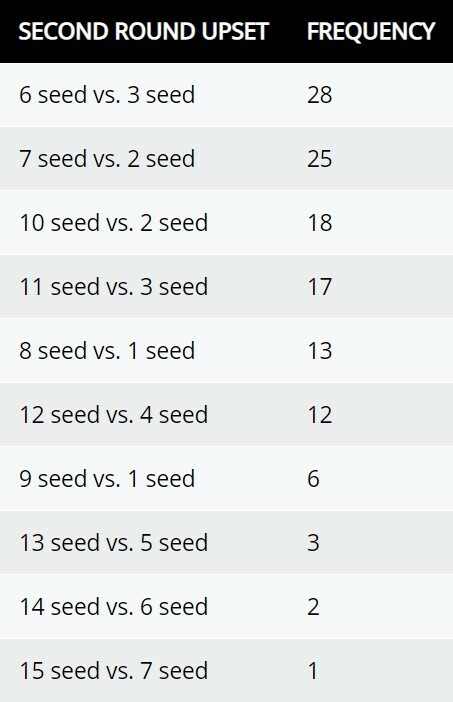 History shows that at least one 10 seed will win. 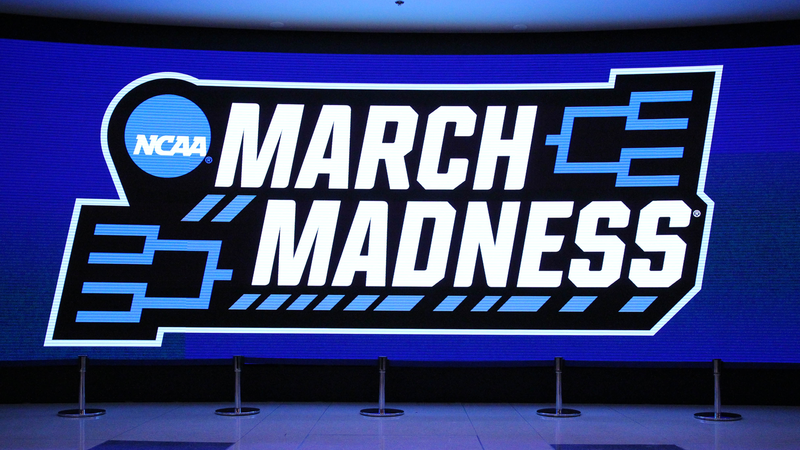 Winning just one less time than tenth-seeded teams, the 11 seeds have also caused plenty of madness in March. In the last three seasons, 11 seeds have won 8-of-12 meetings. One of the more likely 11 seeds to win is Belmont (11) over Maryland (6). Having to play their way into the tournament, Belmont beat Temple by 11, thanks to Senior guard Kevin McClain dropping 29 points. The Bruins shoot with high efficiency and they limit turnovers, meaning they rarely beat themselves. This could spell trouble for the Terrapins, who are talented, but inexperienced and inconsistent as a team. The other 6-11 matchups include Iowa State-Ohio State, Villanova-St. Mary’s, and Buffalo versus the winner of St. John’s-Arizona St.
Ah, the infamous 12 over 5 matchups. We continue to see these upsets every year. In fact, only five tournaments since 1985 didn’t feature one. There are a couple interesting matchups in this group this season to speak to, but the most likely upset would be Oregon (12) over Wisconsin (5). Being a Badger fan, I have watched a lot of Wisconsin basketball. They play the good teams tough and the bad teams…tough. The Badgers historically play slow, disciplined basketball, where blowouts just don’t happen. However, this season is a little different, since the team often makes foolish turnovers, they struggle from the line, and three-point shooting has been rough down the stretch. Oregon plays at a faster pace and are fresh off a Pac-12 tournament win. The team that controls the pace in this game will win. Wisconsin’s big man Ethan Happ will be the best player on the floor, but if he fails to convert on free throws or commits foolish turnovers, the Ducks will move on, even without Bol Bol. The other really interesting matchup is Marquette (5) versus Murray State (12). Both of these teams are great at what they do, and they feature two of the best players in the country. For Marquette, Junior guard Markus Howard led the Big East with 25.0 points, sinking 3.5 threes per game and shooting 89.2 percent from the line. For Murray State, Ja Morant (24.6 PPG, 10.0 APG) looks like a player who will find success quickly in the NBA. Marquette has been ranked most of the season and have wins over Wisconsin, Buffalo, Louisville, Villanova, and Kansas State. Murray State has won 11 straight and score a whopping 83.3 PPG. This will be a fun one to watch. The other two 5-12 matchups are Auburn-New Mexico St. and Mississippi St.-Liberty. Good luck to you all, and if March Madness brings you a big pay day, remember your pal Zach over at FlurrySports!